A double sided sturdy velvet covered board to help you stay organised while you work on your craft projects. The pile of the velvet keeps beads and other small items in one place rather than rolling onto the floor. One dark side, one light side for different coloured gold/beads and other items. Sturdy construction so can be moved with items still on it. 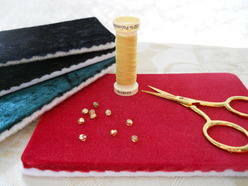 Essential for goldwork embroidery projects and bead work projects but useful for almost any craft project. 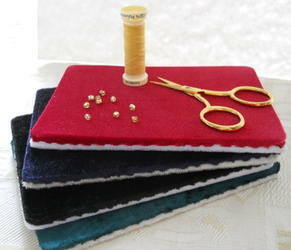 Handmade to a very high standard from high quality velvet in a choice of colours, select from the drop down box.